This crispy garlic oil is originated in Myanmar. It is eaten next to many dishes lik the national dish Mohinga. This nutty, garlicky treasure appears frequently in Thai soups and stews. It really brings a simple bowl of noodles or soup to sparkling life. A small spoonful does wonders for sauces, dressings, and marinades. We also eat this it on top of crispy baked bread. Heat a small skillet over low heat. Add oil and heat until a bit of garlic added to the pan sizzles at once – a minute or two. Add garlic and stir gently to separate. When garlic begins to turn golden and release its fragrance, stir gently. Watch carefully because the garlic can burn quickly. 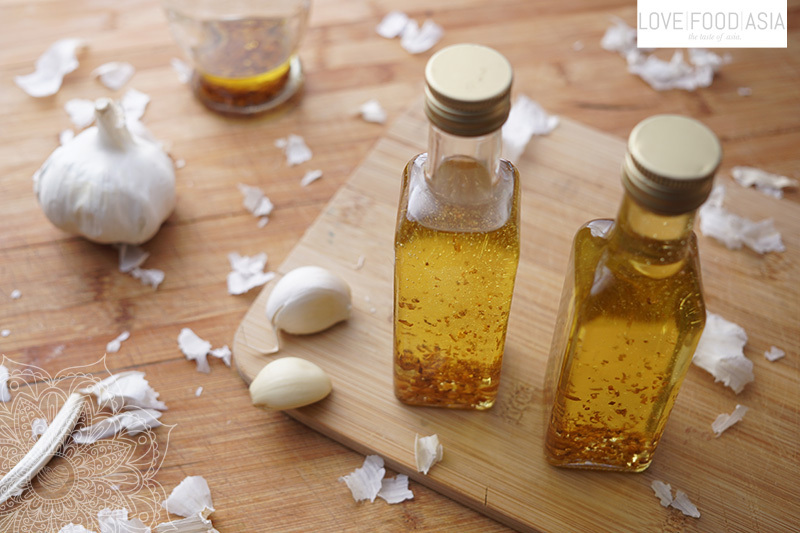 When half the garlic has turned golden, remove from the heat and set aside. The garlic will continue to cook in the hot oil once it is removed from the heat. Set the pan aside to cool to room temperature. Transfer the everything to a glass jar and store in the refrigerator. Eat with Burmese Mohinga!